A physical principle of most of ferroelectric-based devices is electrically induced polarization reversal, which on a microscopic level occurs via the nucleation and growth of a large number of domains. The dynamic characteristics of domain growth as well as static properties of domain structure to a large extent determine the ferroelectric device performance. Recent advances in the synthesis and fabrication of micro- and nanoscale ferroelectric structures [1–4] make it imperative to understand the domain switching behavior at this scale. A major limitation in acquiring this crucial information is the lack of experimental methods to characterize the domain kinetics with the nanometer length and nanosecond time resolution. 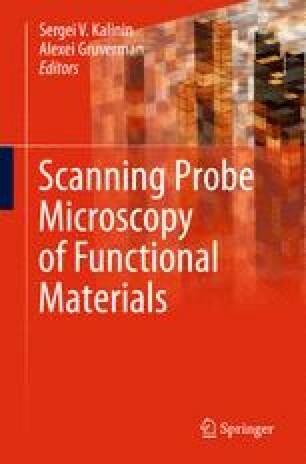 The most effective approach to visualization of domain kinetics is based on linear coupling between ferroelectric and piezoelectric parameters, which on the experimental level can be detected either by X-ray scattering or by scanning force microscopy. High-resolution studies using time-resolved X-ray microdiffraction imaging [5–7] have demonstrated reproducible switching behavior of polarization from cycle to cycle and allowed direct measurements of domain wall velocity at high electric fields. This work was supported by the National Science Foundation (Grant No. MRSEC DMR-0820521) and the Nebraska Center for Materials and Nanoscience at University of Nebraska-Lincoln. The author would like to thank Prof. T.W. Noh for his kind permission to use his data.